Harry was born on the 20th March 1895, the son of Joseph (Stone Mason) and Catherine (née Knowles) Sellers, later of 35 Windsor Road, Fairfield, Buxton (1911 Census RG 14/21233). Harry had five older siblings, John Thomas, Bertha, May, Frederick and Lillian. Joseph had died by this time. In 1911 he was employed as a "Fruiterer's Assistant" by J.H. Dale and was said to have: "... a promising career ahead of him". He also attended the Fairfield Wesleyan Chapel. N.B. Both of Harry's older brothers, John Thomas and Frederick, also served during the Great War - see Footnote below. on to Shorncliffe in November and in February 1915 went into Ramillies Barracks at Aldershot. Service Papers has survived, although "The Buxton Advertiser" reported that he enlisted in September 1914. The Battle of Loos commenced on 25th September, continuing to 18th October. On 8th October, the Division repelled a heavy German infantry attack, and five days later Harry would have been in action again to renew the offensive, now called the "Action of the Hohenzollern Redoubt". The Division succeeded in capturing Gun Trench and the south western face of the Hulluch Quarries. During this period at Loos, 117 officers and 3237 men were killed or wounded. 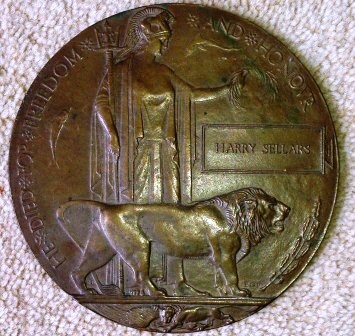 Harry was wounded at Loos, in the head by shrapnel, and was home on sick leave at Christmas 1915. Early in 1916, after a period of rest, a plan was formed that required 4 mines to be blown under the enemy positions, which would be followed by an infantry assault aimed at capturing the enemy front trench called "The Chord". 36th Brigade made the attack after 170 Tunnelling Company, Royal Engineers, detonated the mines at 5.45 p.m. on the 2nd March 1916. Harry was killed the next day, undoubtedly during this attack - one of more than 4000 casualties before the Division was relieved on 26th April. His body was lost and he is commemorated on the Memorial at Loos. "It is with my deepest sympathy that I inform you of the death of Harry, which took place last Friday (3rd inst.). He was shot through the head by a German sniper. I know what a terrible blow it will be to you and the girls, for he was a good lad, and thought a lot of his home. It is only a few weeks since he joined us, but we have spent many happy hours together, hours I shall never forget. When we came to France there were five Buxton boys in our Battalion; two have given their lives for their Country; and the other two are wounded. Then came Arthur Phillips, but I hope to see Arthur again before long; he has gone into hospital, but should be well again soon. 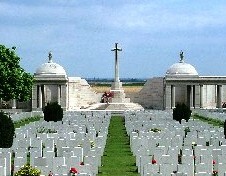 · L/Cpl G/17567 Arthur Phillips did get out of Hospital but on the 31st May 1917 was Killed in Action. and Pt. 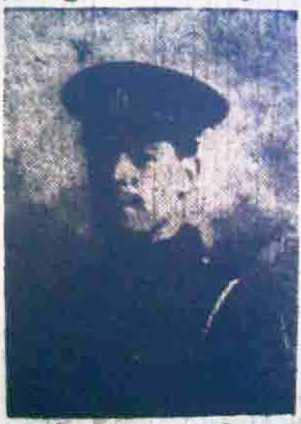 John RAWLINSON - Killed in Action on the 18 October 1915. 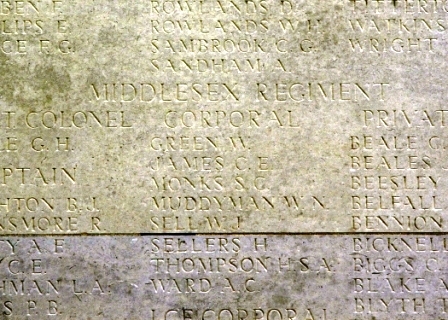 · Harry's good friend, Pt Frank BUTLER (see Photo above), enlisted in the Middlesex Regiment at about the same time. He died on 13 November 1918 (two days after the Armistice) whilst serving with the Army Cyclist Corps. Beatrice Elliott and lived at 117 Fairfield Road, Buxton. 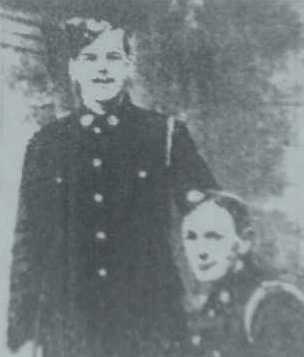 Tom survived the War and was awarded the Military Medal. Private 198057 Frederick SELLERS served with the Labour Corps. · I am grateful to Michelle Young for the photo from the Loos memorial. · ... and to Harry's family for the photo of his Death Plaque (right).